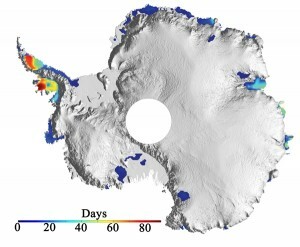 Our study published in mid October in Geophysical Research Letters (Tedesco and Monaghan, 2009) documents record minimum snowmelt for Antarctica during austral summer 2008-2009 and lower-than-normal melt for several recent years, based on a 30-year satellite microwave record. Numerous blogs have cited the results as a challenge to previous studies reporting Antarctic warming, while also steadfastly ignoring other studies with similar results (e.g. Barrett et al., 2009). They have overlooked that these studies show that Antarctic warming has occurred mostly in winter and spring, whereas melting of course occurs in summer. And they oversimplify the causality and hence confuse our prediction for the future. We found that the same mechanism that has primarily caused low snowmelt in recent years will likely change in a manner that will enhance snowmelt in forthcoming decades. A brief summary follows. 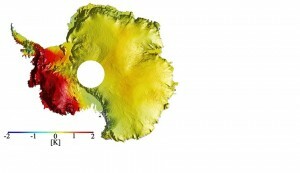 Map of Antarctica showing number of melting days in summer 2008-2009. Monthly averaged December-January surface temperature anomalies (K) for 1998 (left, strong negative SAM and SOI) and 1999 (right, strong positive SAM and SOI). cooling impact of the SAM. Therefore, the linkage between the SAM and snowmelt leads to our key conclusion: that enhanced snowmelt is likely in Antarctica as the SAM trends subside during the 21st century and summer temperatures become warmer. Our results agree with studies that have noted cooling and/or slower warming during the past three decades due to increasing SAM trends over the same period. Additionally, our conclusions do not contradict findings showing strong regional warming on the Antarctic Peninsula and in West Antarctica for the past 50 years, and warming over the entire continent for the past century. Our record is limited to the satellite era only, during which ozone depletion has dominated Antarctic summer temperature trends, and as already noted above, the observed warming in the last 50-100 years has occurred mostly in winter and spring. This context is important. We must get better at marketing our data and corresponding interpretations to the general public. Otherwise, we will continue to loose the publicity battle despite the growning physical evidence in support of climate change. I don’t understand the second figure. The legend says both figures are for the same year, 1998, and it refers to left and right, and I see one above the other. There is a problem with the legend of the second picture. The question is: Are Antarctica’s ice sheets thinning beyond IPCC formal projections and if so is this due to or scheduled to be due to warming or increased sensitivity is this makes sense? Is the figure on the right for 2008? At home at RealClimate–in the denialosphere, not so much. The second and third figures are for 1998 and *1999* according to the auxiliary material at GRL. Curious about ozone here. When you say “ozone depletion has dominated Antarctic summer” – does that have the effect of making the summer much cooler than otherwise? Because with a healthy ozone blanket, would not the Antarctic summer be much warmer? Of note is that we (over at World Climate Report) were one of the first places to highlight this finding, but never made any mention of how it meshed with Antarctic temperature trends. But, your explanation brings up a question: What is the relationship between SAM and Antarctic precipitation? If overly strong SAM is inhibiting warming, is it also inhibiting precipitation? The deniers I’ve seen referring to your work have given it as a refutation of data from, e.g. GRACE, which show accelerating ice loss over recent years. My understanding is that your ice melt index is an approximation for ice melting at the surface of the sheet but is not a good approximation for total ice loss and it is not in contradiction with data showing accelerated ice loss. This would be a good thing for you to clear up. It’s about as good (slightly more, but not massively) as sea ice extent is an approximation for total ice loss/gain. The difference being 15% coverage is counted as highly as 100% when it comes to extent, so the more broken up the ice (which is more likely in the summer and more likely still for thin ice) the worse extent is an analogue for ice volume. Just a quick note re: the quote above. This site, and many others, are getting the evidence out there and I for one can’t thanks everyone here and to all of those contributing updates on the science. I’ve personally linked this site many times in the last while to counter the endless assault of skeptic arguments that tend to dominate forums. IT is working. Thanks guys for the info. Very worthwhile site which I too send out to others for converting the doubters. One question I would like to ask and that is has the cumulative ice melt over the last 50 years been incorporated into the data? By this I mean that 50 years ago the ice cover would have been x % more or less than the % cover of today, or has it been pretty stable with annual increase and decrease on a seasonal basis? It would seem that from evidence that I have been given by a good friend of mine (former base leader at Port Lochroy in the mid 1950’s when they first found indications of an anomaly in the atmosphere became apparent, later called the Ozone hole.) that the ice cover is very similar today as it was way back then. This is supported by photographic evidence showing the ice sheets behind the base and little has changed. Any views on this? Does that mean that it is a race between ozone recovery winding back SAM and allowing warmer air into the heart of the continent, and general AGW strengthening SAM and maintaining the blockage so that the centre of the continent doesn’t warm as much? If so that is obviously a fairly complex prediction to be having to convey to the broader world. The comment earlier – “We must get better at marketing our data and corresponding interpretations to the general public. Otherwise, we will continue to loose the publicity battle despite the growning physical evidence in support of climate change.” may be particularly appropriate in this situation. Thanks for a very informative post guys! Stronger summer winds cause less melting? ( they might accelerate sublimation). Please also explain why increased exposure to ultraviolet rays due to ozone depletion might cause stronger west winds in Antarctica. Otherwise there will be skeptics galore about this very paradoxical result. Time to move a few hundred polar bears to this locale before they lose their arctic habitat. With larger ice mass at the south pole compared to the north, this could cause some wobble and unpredictability re the earth’s rotation and the stability of the seasons, “summer” being one of these. Thank you for good co0ment. I am always irritated by the arguments of deniers without correct understanding of new scientific findings. Academic communities and journalism are, I believe, responsible to providing their correct interpletation. I am still not sure whether you are saying that the Antarctic ice is increasing or decreasing. If the melt is refreezing then there should be no change. However it would seem that the ice mass is increasing due to the Ozone hole, and so there is a negative contribution to sea level rise. Why can’t you come clean and say what you really think? May I take this opportunity to drive yet other nail into the ACC sceptics coffin. Take a look at science daily. Two links —http://www.sciencedaily.com/releases/2009/10/091023163513.htm : and this one — http://www.sciencedaily.com/releases/2009/10/091019162929.htm. They show highly accurate sediment data from a Greenland lake not subject to glacial erosion from the past 2 ice ages and 3 interglacial periods spanning roughly 200k years. They indicate very strongly that since about 1950 ( and I would say that date is pretty much spot on with all the reports I have read) there have been marked changes in the marine ecology specifically diatoms and algaes that have not occured ever during the past 200k years, despite ice ages and cyclical fluctuation in solar maximum’s, the earth’s tilt and associated wobbles etc. This is the first time that quatic indicators in sediment are showing the unmistakable affects of global warming. Sorry skeptics – but since these are NOT natural indicators, the only other possiblity is antropogenic! And around 1950 is when I have seen most of the worlds glaciers really begin to retreat in earnest as well and the chart of CO2 really beginning to take off like a rocket. Some feedback on this would be most welcome. The problem is that actual thermometer readings from close to the lake you are referring to show no warming since 1950. That would seem to be conclusive proof that the changes in the marine ecology have another, non-temperature related cause. Somewhere nearby gets more rain because of higher water content of the air and this lake gets more runoff into it or less rain because it falls elsewhere that isn’t the catchment. Migrant birds now turn up earlier and stay longer because where they leave from is changing its climate. These migrants eat the fora of this lake at different times and for longer. Or they may move to another lake where the food is more plentiful and the larger predator species are not culled by the birds. Sure, Eric, check out the temperature from nearby Clyde, N.W.T. (as represented in the GISS temperature record), as we show in our World Climate Report story. So Antarctica is losing ice (Velicogna 2009) but it is not from snowmelt (Tedesco & Monagan 2009). So where is Antarctica losing it? May it be from ocean-driven ice shelves melting? Thanks for the article, it’s very helpful against the constant disinformative campaign from skeptics, specially when it comes from the authors themselves. How come the graph you’ve got has the temperatures of 1-5C when the NASA data you link to as the original data shows temperatures -10.5C down to -14C. doesn’t really help, does it. If it’s unique, you can’t really draw any conclusions except that every other place doesn’t do that. About all you can say is “It isn’t doing this!”. Have the authors analysed the silt for chemical residues, eg DDT? This was shown to accumulate in lake silt in a Swiss study published in November’s Environmental Science & Technology. There is an old DEW Line station near to the the lake, so spraying against insects would be expected. We showed summer (JJA) temperature from Clyde–which was the season most germane to the findings discussed by Axford et al. A very cogent and credible analysis. Not inconsistent, as you say with global warming or indeed the IPCC sea level assessment but inconsistent with the more extreme forecasts of increases in sea level over say the next 30 years. “Temperature and Precipitation Trends in Canada During the 20th Century” Zhang et al. (2000). How unusual such a steady temperature is in a global context can be seen in figure 3.9 on page 250 of Chapter 3 of the “IPCC’s Fourth Assessment Report (AR4), The Physical Science Basis”. This is for a trend of over 100 years!!! The only significant slight cooling in the whole of the Earth in the 20th century was in part of the North Atlantic. So picking a station of the North East coast of Canada is slightly cherry picking. Especially the period chosen (i.e. over the whole century). “Recent Cooling along the Southern Shore of Hudson Strait, Quebec, Canada, Documented from Permafrost Temperature Measurements” Allard (1995). say that the previous lack of warming is due to the Thermohaline circulation. In general, “no warming since 1950” isn’t true, it’s warmed considerably over the last 30 years. PS I study computational neuroscience, not climate science! Please correct my interpretation :D Also maybe a link to the effect of the Thermohaline circulation on such a temperature record? Chip, germane in what way? After all, a study into the temperature differences from 1998 to 2008 is germane to a study of how it’s cooled. It is only germane however in that picking the data that way is the only way to get a decade long cooling, therefore picking other data (like, say, 1988 to 1998) would not help a study of how it’s cooled. It is also incorrect to label a point to data you used that doesn’t point to the data you used. IS there any merit to these articles denying AGW? We picked Clyde, N.W.T., because it was the station closest to the lake that was being studied and thus presumably best represented local environmental conditions. We showed the summer temperature (and our graph was clearly marked as such), because that was the season that Axford et al. discussed (and produced their own reconstruction of). And I linked to the GISS data page for Clyde so if you went there you would know what you were getting (rather than linking to a page full of nothing but data without description). Baffin Island (where sediments are extracted from in Axford et al., 2009) is not covered in Zhang et al. (2000) (though the warming seems to be widespread in the southern area that they cover). I havent’t read the article, but from their press release, the attribution part seems to be that cold species survived previous warming periods (being even abundant) but not this one. (If that’s all), the reason might be the rate of the current warming, but other (surey anthropogenic) stress may share the responsibility. You have no idea whatsoever as to what is scientifically “reasonable” and what isn’t, do you? You start with the belief, then pick the facts to support it. Seems that your single station data would be at odds with most other Arctic station data for that time period. Of course, anomalous stations that don’t show significant warming (about 0.1 C in this case) are not questioned by “skeptics”. How’s the ice doing on the island that has not warmed? #36: Chip, why you picked up the summer record in the context of AGW while the guest point out “Antarctic warming has occurred mostly in winter and spring, ..”? Of course, the paper you refered talked about the arctic lake, not the antarctic, but it is quite doubtful to neglect these unless there is an evidence that the arctic warming never occurs in winter and spring. higher across the Bay the station moved with the village in the 70’s. The original station was much lower at sea level, knowing inversions Clyde’s temperature record should not to be used ! and again, in the late 80’s the station moved to the airport! Another few miles away. However did the research need be a little more thorough… Try again!!! Whoever did the research, of course. Clyde is a most beautiful place with mysterious Fjords just near by. 28: Mark. It’s unique in respect that the sediment shows an unbroken linear timeline back 200ky. Most other glacial lakes only go as far back as the last ice age 50ky when the weight of the moving ice would just scour clean the lake bed removing any old sediment in almost all cases. Mark have you read the report? 24:Mark. Everything you mentioned would be cyclical at least over the last 200ky except when you mentioned migratory birds may be visiting the lake sooner (and presumably eating more midge larvae?) because the climatic conditions are changing in response to CC. There may be grain of possibility there?. Whichever way you cut it..still comes back to climate change doesn’t it! Re 29: Adam Gallon. DDT would indeed affect the midge larvae more than diatoms due to bio-amplification. It seems that the more ‘silica’ in the water the faster the growth rate of diatoms due to thats what their shell is make of. I would imagine that in an enclosed lake the amount of silica in ppm would be reasonably constant. Maybe I missed it, but what has ozone got to, do one way or the other, with antarctic temperatures? Can someone point me to an answer. Greetings in my first comment and thanks for the huge effort put in this site or, at least, in its huge positive role as information source for us non-scientists. After reading this post I keep a couple of doubts. First, why is snow melt decreasing if the ozone layer is already increasing? Shouldn’t there be a progressive trend the other way round? And second, shouldn’t we notice a similar effect in the North Pole, annular wind-wise?